Google has built a reputation ever since its Nexus phone series, for giving users the perfect stock Android experience. Since last year’s Pixel launch, Google showcased their H/W prowess. With the Pixel series being a premium line of phones, the Pixel 2 and XL 2 have now improved and just launched across the globe. Let’s find out if Google can match the latest iPhones and the Samsung Note 8. The Aluminium unibody feels great on both devices with less glass than the last iteration at the back and matte finish coating going all the way to the bottom of the phone. Thankfully though, it’s not a fingerprint magnet and doesn’t show too many scratches even after a few unfortunate drops. The Power button is on the right and volume rockers below it which are easy to reach if you’re right-handed. Nano SIM slot on the left and a Type C charging port at the bottom. Google thinks the 3.5mm jack is dead only a year after they mocked Apple but shockingly they don’t provide type C earphones in the box. There’s only a type C to 3.5mm jack connector which is seriously embarrassing for a damn expensive phone! On the front you have the stereo speakers, the top one which doubles as an earpiece and the second one is located below the display. Above the display is the 8MP camera and the notification LED. The new Pixel is manufactured by LG so you see the same 18:9 ratio here, just like on the G6. Even the OLED screen is made by LG with Gorilla Glass 5 that subtly curves at the edges. There are quite a few issues people have complained about like screen burning, and a slight Blue tint when viewed at an angle and even when the Night Light is turned ON. The fact that there were talks of such issues even on the original Pixel makes me think if Google hasn’t been able to figure out the reason for them. On the front, there are no physical buttons and the fingerprint sensor is at the back in the centre just below the 12MP camera and LED flash. The one key feature this time is the Squeeze feature similar to the HTC U11 that can be used to trigger the Google Assistant. Both phones have Snapdragon 835 processor and 4GB RAM with 64GB or 126GB storage options. They are also IP67 water and dust resistant. 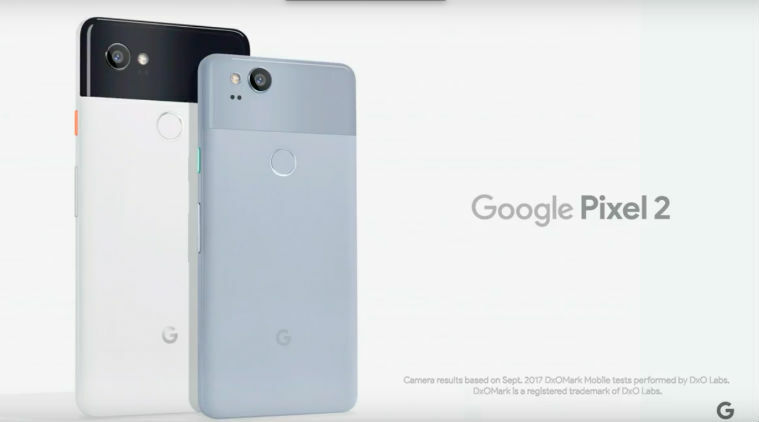 And just for the record, The Pixel 2 is made by HTC and the Pixel 2 XL by LG. The phones run vanilla Android 8.0 Oreo (Yum!) out of the box which is slick and really snappy. The Google Search button is now at the bottom of the screen and the Lock Screen supports an Always ON display to show notifications. At the bottom, it also shows the Track name of any music playing around you without any internet connection since it has a database of track titles stored within. Swiping right from the home screen takes you to the Google Now screen with relevant news and updates in the form of cards. Double pressing the Lock button opens the camera app, while a flick of the wrist can change from rear to front camera and vice versa. Google Lens was introduced with the new phones which have also been passed on to older Pixel devices now. It uses advanced AI to find what the image is, show up relevant Google search results and even identifies addresses from text. Google still believes you only need 1 lens and not 2 at the back to give the portrait effect or be the best camera out there. To be honest it’s as close to the Note 8 in terms of image quality but doesn't beat it. Some images are too yellow-y for my liking. It does beat the iPhone 8+ but only slightly. The camera has laser and dual-pixel autofocus which is extremely quick. Default HDR+ mode clicks amazing pictures but it still takes a few seconds to process these images. Video recording from the 12MP camera maxes out at 4K on 30fps with improved stability, so no more shaky videos. Sound recording can be better, however. The camera app does not give you any manual control modes but maybe Google thinks not many people use it and when they have the AI to go along with best in class camera, you should get the desired results on Auto mode. Front stereo speakers are a great addition, mainly when gaming and watching videos. Talking of gaming, Asphalt Extreme & GTA ran lag free and without any frame drops. Multitasking is a breeze and you have split screen mode by just long pressing the menu/apps button. And to obviously handle all this you need a great battery, the 3520 mAh does justice to the phone and on quick charge, it can reach 80% in an hour which is great! Disappointingly it doesn’t support wireless charging and you might also not get fast charging if you use a third-party charger. 2nd most expensive phone after the iPhone X, average screen, plenty of bugs and issues in the first batch (complaints aplenty, but Google might just fix them with s/w updates). The fans will still see the improved design, best in class camera, improved AI and a lag-free vanilla Android with the promised updates for 3 years. Competing with the Note 8, LG V30 and the iPhone 8+, the Pixel 2 & XL 2 will face some challenges, but only time will tell.